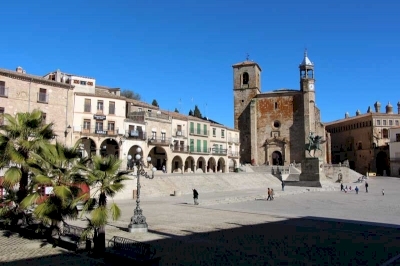 Plasencia - Monfragüe - Trujillo : Paysage méditerranéen is part of the Tentative list of Spain in order to qualify for inclusion in the World Heritage List. I visited Trujillo on a trip to Extremadura. I did this even before I started caring about TWHS, just because the town seemed to be a nice place to visit and indeed, it was worth the detour. The town is the birthplace of Hernan Cortez, the conqueror of the Inka Empire and honours that with a statue on the main square. Additionally, his birth house was turned into a museum. Apart from that, Trujillo is a very beautiful little Spanish town with influence on South American colonial towns. The fortress overlooking the town is certainly a highlight, but the ensemble of houses in general is very appealing. I did not visit the Monfraguë NP or Placencia and frankly, I don’t really get the connection between the sites. There are two towns and a national park. It seems to me Spain just took 2 FTWHS and a new place and packed them into one in hope to increase chances to get at least one inscription. Trujillo is only around a 40mins from Caceres WHS and on the way to Guadeloupe WHS, so not much effort is needed to pick it up if you are in the zone.